My work with adaptive athletes began when my brother Sean was injured almost 25 years ago. He’s paralyzed from the waist down and lives life from a wheelchair where he more than rolls with it, he thrives. Ever since we topped out on El Capitan for the first time in 2005—that’s 3,000 feet of vertical with Sean doing an equal amount of pull-ups via fixed lines—people have come to me looking for answers to their questions and bridges for their desires. This lead to the creation of Paradox Sports, a non-profit I co-founded with DJ Skelton, a severely injured Iraq war veteran. For multiple years, Wayne Willoughby has stayed in touch, and professed through deed and word, his need and capacity to do a climb in the Black Canyon of the Gunnison in southwestern Colorado. He would occasionally call, email and text to discuss his training regimen or his current recovery from an unexpected setback, but always to express his joyous gratitude for even being considered a potential graventure (gravity adventure) partner. Eventually, we set a date. Personnel bailed at the last minute but it took little time to find new and more psyched partners. Then we met at the rim of an impossible gaping chasm and went for it. When Wayne arrived at 1:30 a.m. he surprisingly parked his car behind the handicap space at the south rim pullout saying, “I’ll leave that for someone who may need it.” This beautiful, unexpected response set the tone for the next 24 hours of slow-motion exertion. Wayne’s unique and powerful perspective imbued the day with a feeling akin to the sensation that affects you prior to the onset of an illness or that intuitive tingling just before a momentous life occurrence—the tremors of sudden, lasting change. We started rappelling into the granite maw at 3 a.m. joined by Dave Chew and Jack Plantz (huge thanks to Steven Van Sickle for rappelling in 1,000 feet and working and telling jokes with us until we started climbing). As soon as we went over the edge, the roar of the Gunnison River filled our ears, stirred us and made me feel like I could simultaneously fall to my death and drown. The beauty and horror of dropping into such a foreboding chasm is knowing that the only way out is to climb up. There is no bailing back down to the car, you can only bail up. The river, constricted and angry, provided the droning soundtrack of roaring freeway traffic for our 24-hour ascent. On the second to last rappel, as we made our way down to the bottom of the Black Canyon, Wayne started to wretch and vomit. As he balanced his helmet onto the rock in front of him and recovered, he whispered, “I’m so glad they developed a vaccine to prevent others from experiencing polio.” Wayne contracted airborne polio as an infant while passing through a Tennessee town on a road trip with his parents almost 63 years ago. By the age of 7, he began to deal with the debilitating effects of post-polio syndrome. 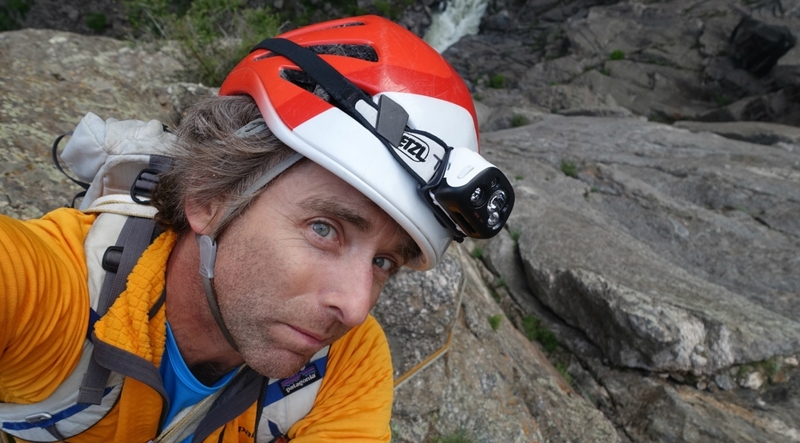 This was Wayne’s first foray to the Black Canyon and his 35th overall ascent of a big wall. 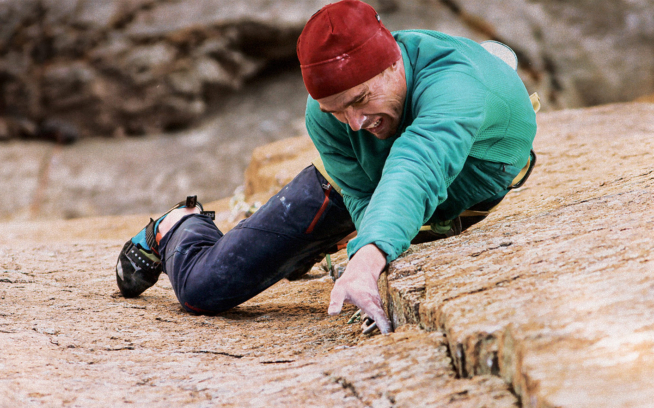 His slow, methodical pace up the 2,000 feet of granite was otherworldly. He ascended a fixed line that Chewy and I trailed as we climbed the cracks and face holds of Astro Dog. The day slowed as if we were using an atomic clock that measured time via waves of nausea and the frequency of painful pauses. I felt like we were visiting with an extraterrestrial being whose understanding of discomfort and suffering utilized a different, almost opposite, meaning in its symbols. Wayne would immediately wake from short power naps and declare himself ready to go with an unexpected joy and excitement. “Okay, okay, let’s do this,” he would say then prop himself upright, arrange his ascending system and then wretch, squeezing his entire body with a startling intensity that seemed to embody the same profound fierceness with which he grabs onto life, thriving on his terms, utilizing his normal. Chewy and I would exchange glances as Wayne dealt with such great difficulty, with an even greater calm and acceptance. We knew we were in the presence of a gifted teacher, one demonstrating the beautiful paradox of fragility and strength, and living with a breakable invincibility. I always say that when you’re going into the mountains to attempt something difficult, objectively hazardous and of a massive scale, that it’s advantageous and wise to choose a partner who is stronger, younger and has equal or greater stoke for the mission. Triple check with Chewy. One particular pitch (pictured below) was a mix of medium-boldness runout, devious-though-unlockable cruxes and steep-yet-not-wickedly-overhanging climbing—a mid-level intro to the Black Canyon “thinking man’s” requisites of placing gear, staying calm amidst the cross traffic of ledges and loose choss, and taking in the grandeur and epic beauty of such an improbable locale while pushing the rope up with your belly button. These places, united with these people for the purpose of overcoming adversity, immersing ourselves in wilderness and wildness, and simply having a bird’s eye view of this whole improbable planet, is the best approximation I’ve come up with for the answer to the question: “Why are we here?” In the adventurous sense, if it’s a summit you want to reach, a place you want to visit or a river you want to run, go. In the creative, emotional, intellectual, career, relationship sense, if there’s a change you want to make, make it. Eight decades if you’re lucky. I’m closing out my fifth. At one point, I sat back on a broken ledge and watched as Wayne slowly pushed and pulled his withered, fierce limbs up the rope. It was a form of paint drying, yes, but it was also a piece of artwork brushed on a monolithic canvas from the suffer palette—one tug, one step, one breath at a time for 24 hours, framed by darkness from beginning to end. Fast forward to 9 p.m., as Wayne inched towards the last belay perch, I delivered a litany of jokes over the radio to the members of our party, who were strung out hundreds of feet above and below. After releasing the transmission button following a particularly effective zinger, the sound of laughter echoed off the surrounding granite features and dissipated into the night sky. I’ve always found that the release of tension via ridiculous humor and off-color observations helps to preserve sanity amongst such toil and uncertainty. Utterly wasted, awake for thirty hours, the blackness interrupted by a slim beam of light on the wall above, I finally ascended to the canyon rim, feeling deep relief and a profound connection to humans being. The Black Canyon delivered and Wayne Willoughby completed the first one-day ascent of the wall, jugging lines and overcoming the conventionally perceived deficits of polio. He’s an elective challenge master and impressed us all with his unlikely and powerful combination of fragility and tenacity. Later, in a sleep-deprived exhausted stupor, I repeatedly opened and closed the doors to the car looking for something I never found, eventually passing out beside coiled ropes as a slight wind tossed my hair and chilled my worn body. This story was adapted from a series of photos on Timmy’s Instagram account. You can follow him for more at @timmyoneill.